Suzie Tuffey, former Bergan High School and North Carolina State long-distance runner, must be ranked as one of the most talented track and cross country performers in Greater Peoria history. 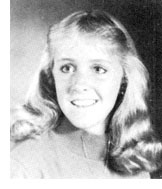 She finished as the runner-up in the 1,600 meters in the Class A state track meet in her frosh season in 1982 and came back to win the 800 meters and the 1,600 meters as a sophomore in 1983. She was the 1,600 (4:46.5) and 3,200 meters (10.13) champion in her junior season, wins that were still Class A state records at the time of her induction. Her time in the 3,200 was a national record at that time. In her senior year she was injured a good part of the year, but won an indoor two-mile run that was a national record at that time. In the 1984 Journal Star Honor Roll meet she won the 3,200 in 10:03.0, the fastest time ever for the event in Illinois and also the national best for that year. She also won the 1,600 in a record 4:52.6 that same year. During the 1985 prep season she also ran a 4:43.4 1600. At North Carolina State she won the NCAA cross country meet in the fall of 1985, her freshman season, but injuries then restricted her running the remainder of her college career. She was third in the NCAA cross country meet as a junior and 15th as a senior. Her college running was slowed by stress fractures and surgery because of tendon problems in her ankles. She had won the four-mile run in the 1984 Steamboat Classic in 21:31, but then did not compete for several years until returning to the Classic in 1991 after recovering from a stress fracture in a hip. She finished 16th in 22:05.